A Virginia college shut down an art exhibit featuring Confederate statues after some students cried racism — but the artists countered that while they could have better communicated the intent behind their work, their creation wasn’t racist and neither are they. The monuments in the exhibit were from Monument Avenue in Richmond, the outlet said, which includes statues of numerous Confederate icons. Richmond is about two hours southwest of Staunton. “We wholeheartedly believe the Civil War was fought over slavery, that these monuments were installed to foster oppression and that they ought not remain installed exactly as they as are because they don’t represent what we value,” Jere Williams and Pam Sutherland added in their statement, the outlet noted. The Hunt Gallery exhibit opened Nov. 5, WHSV-TV reported, and students were given the opportunity to express their views through an interactive display. An Instagram account titled “yallracistatmarybaldwinu” was launched to call attention to the exhibit, the station said, and students took up the issue with the student senate Nov. 6. Inside Higher Ed also said students circulated an email calling the exhibit racist. Then faculty members spoke with the artists about the students’ concerns and decided late in the afternoon Nov. 6 to remove the exhibit as soon as possible, WHSV said. By the evening of Nov. 7, the exhibit was gone, the station said. What did the artists say? The artists added in their statement that they agreed their exhibit should have been removed — but that it was misunderstood, the outlet said. “We assure you that we are neither in agreement with the ideology of the Lost Cause nor racist (as many of the students called us),” Williams and Sutherland wrote, according to Inside Higher Ed. What’s the background on the Confederate Monuments in Richmond? The Confederate monuments in Richmond have been a hot topic, particularly over the last year. After the deadly 2017 riots in Charlottesville, Virginia, the Richmond city council has been embroiled in controversy over what to do with the monuments. 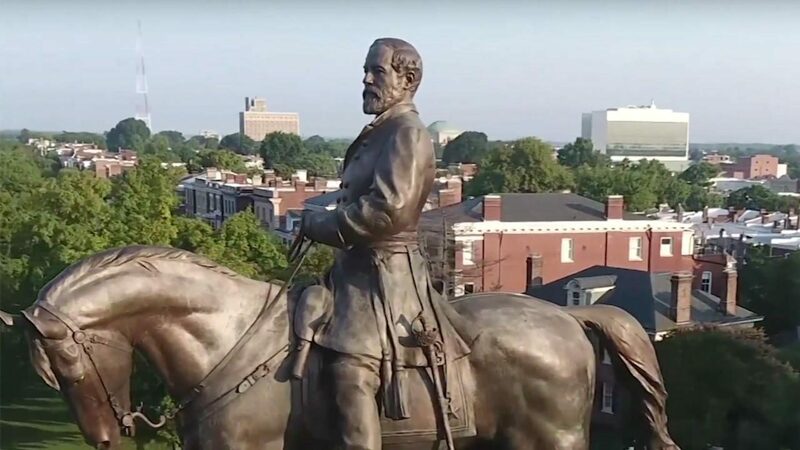 The Monument Avenue Commission in July submitted a report to the mayor recommending the removal of the Jefferson Davis statue and adding signage to other monuments, WTVR-TV reported. But last month the council voted against a resolution that would ask the state’s general assembly to give the city authority to decide the fate of the statues along Monument Avenue, the station said.